For the treatment and control of gastro-intestinal nematodes, lungworms, eyeworms, warbles, mites and lice of beef and non-lactating dairy cattle. For the treatment and control of psoroptic mange (sheep scab), gastro-intestinal nematodes, lungworms and nasal bots of sheep. POM-VPS. A sterile non-aqueous solution for injection containing 1%w/v ivermectin. 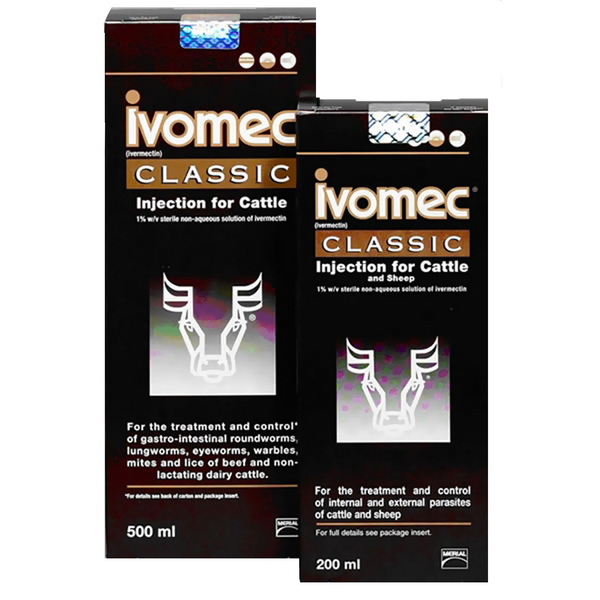 IVOMEC Classic Injection for Cattle and Sheep may also be used as an aid in the control of biting lice (Damalinia bovis) and the mange mite (Chorioptes bovis), but complete elimination may not occur. To obtain optimal benefit from the persistent activity of IVOMEC Classic Injection for Cattle and Sheep for grazing animals, it is recommended that calves which are set-stocked in the first grazing season should be treated 3, 8 and 13 weeks after the day of turn-out. This can protect the animals from parasitic gastro-enteritis and lungworm disease throughout the grazing season, provided they are set-stocked, all the calves are included in the programme and that no untreated cattle are added to the pasture. Treated animals should always be monitored according to good husbandry practices. For the treatment and control of sheep scab Psoroptes ovis, two injections with a seven-day interval are required to treat clinical signs of scab and to eliminate mites. Benzimidazole-resistant strains of Haemonchus contortus and Ostertagia circumcincta are also controlled. 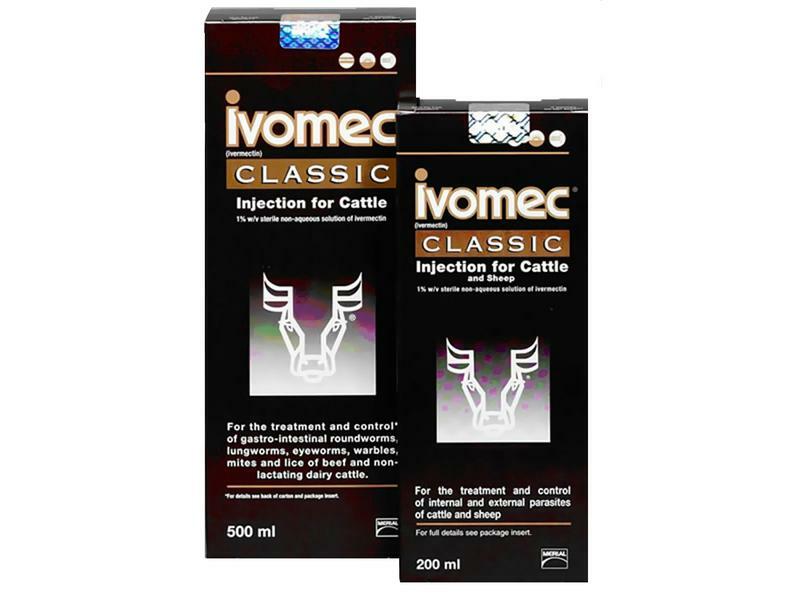 IVOMEC Classic Injection for Cattle and Sheep should be given only by subcutaneous injection, using aseptic precautions, at the recommended dosage level of 200 mcg ivermectin per kg bodyweight under the loose skin in front of, or behind, the shoulder in cattle and in the neck in sheep. When treating sheep of less than 16kg, seek veterinary advice regarding the use of 1 ml disposable syringes graduated in increments of 0.1 ml. For the treatment of individual sheep, a syringe not exceeding 2.0 ml and calibrated in increments of 0.1 ml should be used. There are currently no questions for Ivomec Injection - be the first to ask one!